We were on "This N That" today and Mother's Day is May 10th! 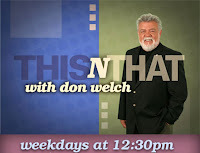 At 12:30pm today, we were on "This N That" with Don Welch. He interviewed us about our chocolates, how we started, and asked about our upcoming events. See the link here. We were followed by Mickey McCamish; the spokesperson for this weekend's Epilepsy Foundation's Chocolate Lover's Fling. It's a benefit event at The Bessie Smith Hall on April 26th. We will be presenting one of our signature truffles (won't tell you which one until afterward) in the contest. See you there! Tickets are $25 in advance and $30 at the door. Click here for info. Also, I'd like to remind everyone that Mother's Day is May 10th and we will be shipping items up until May 5th. So, get your order in early and make your Mama proud!